This article will cover steps for syncing SharePoint document libraries with the OneDrive sync client for Windows. 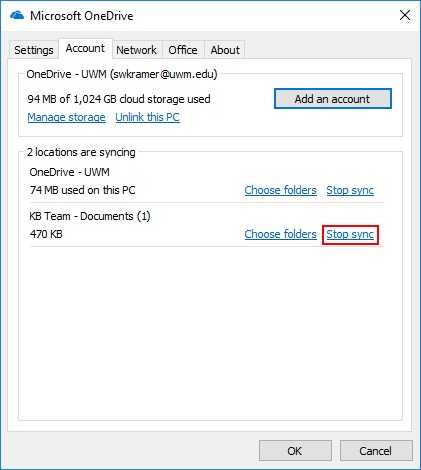 Note: This article assumes that you have already installed the OneDrive sync client on either a Windows Personal Computer or Windows University-owned Computer. The Mac version of the OneDrive sync client does not support syncing SharePoint document libraries at this time. Open your web browser of choice (Google Chrome is shown) and navigate to portal.office.com. Once logged in, click the app picker, and click on SharePoint. 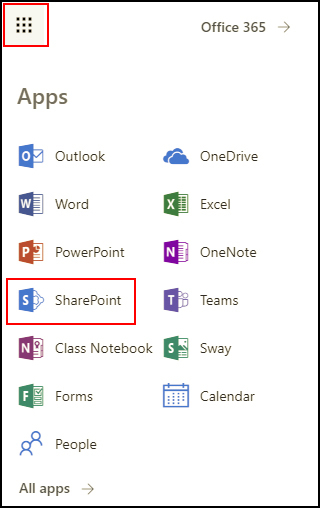 Click the SharePoint site that contains the document library that you want to sync in either the Frequent Sites or Following section, in this example it is KB Team. Alternatively, you can go directly to the SharePoint site if you know the URL or have it bookmarked. Navigate to the document library in the site that you would like to sync. In this case, we will sync the Documents document library. In the toolbar of the document library, beneath the title of your Site, click Sync. In the pop-up that appears, select Open Microsoft OneDrive. You can check the Remember my choice for Microsoft OneDrive links. 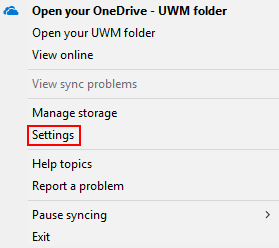 You may be prompted to login to OneDrive again, if so, login using your UWM Office 365 credentials. Then click Start sync on the pop-up which appears. Individual files not contained in folders in your document library may not appear and this is expected behavior with the sync client. A desktop notification will appear stating that your files are being synced. Select it to view your newly created folder. After some time, depending on the size of the SharePoint document library, your documents will be synced, and you can access them at any time by opening File Explorer (Windows Key + E). Your SharePoint's files will be located under the UWM heading on the left hand side of File Explorer. Click on the Upward Arrow in your Task Bar. Then, right click on the OneDrive Icon. Select Stop Sync on the library you would like to stop syncing. Click on Stop Sync and your SharePoint Library will no longer be synced to your PC.